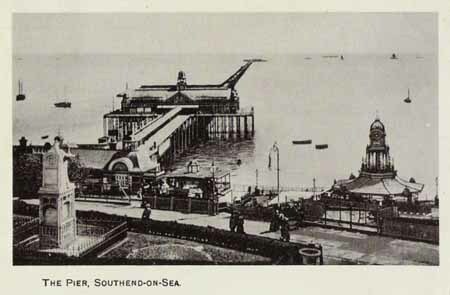 Southend Pier Southend - Page 1 This page is under construction! 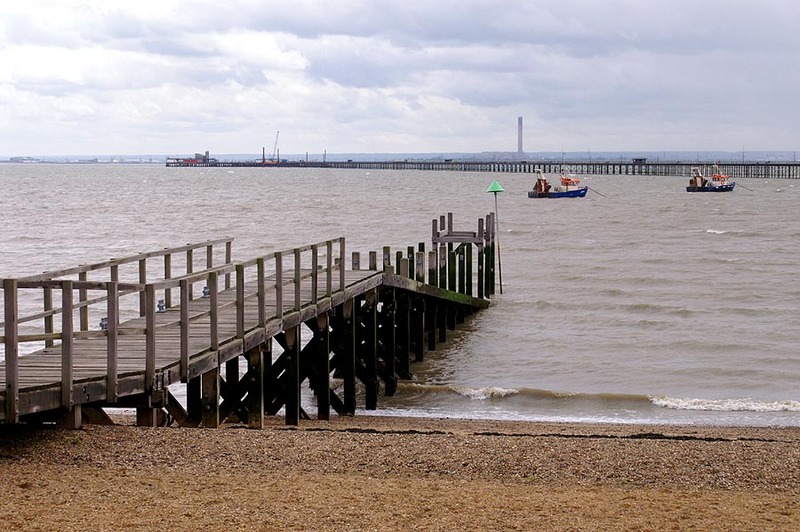 This is one of a series of pages devoted to the Thames and Medway Estuaries. 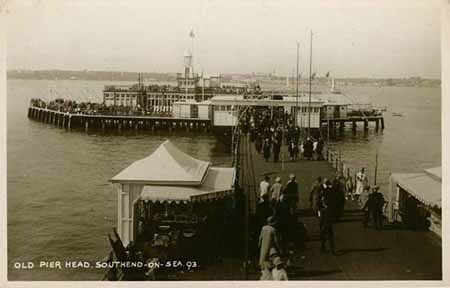 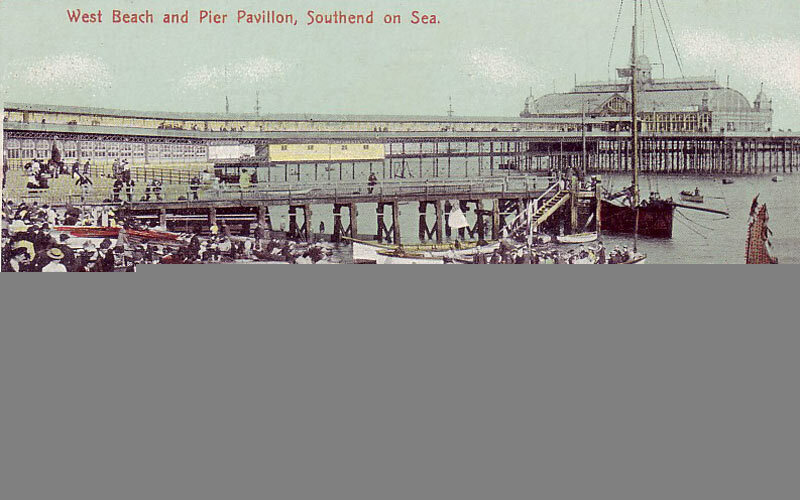 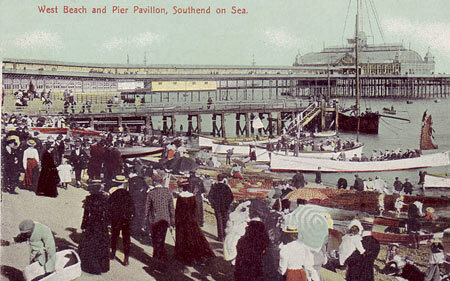 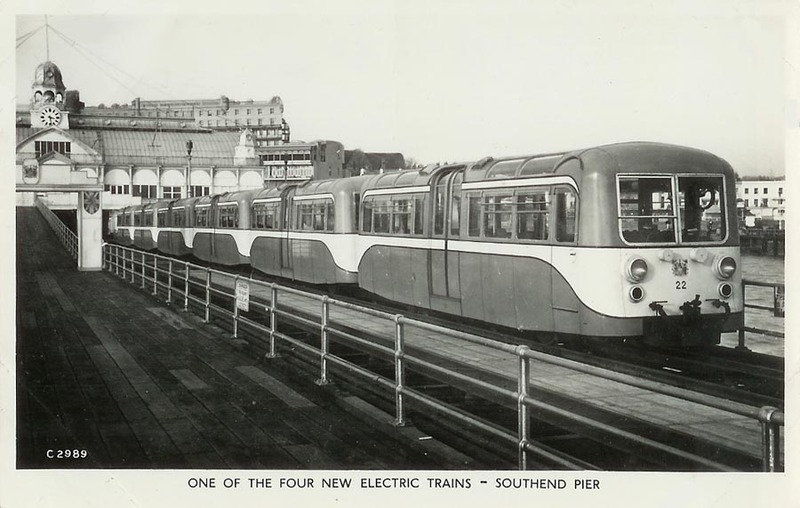 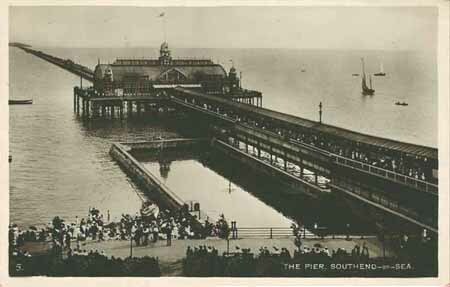 This page shows postcards and photographs of Southend Pier and the pier railway. 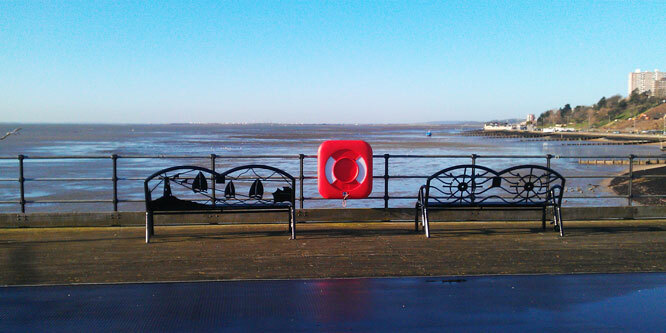 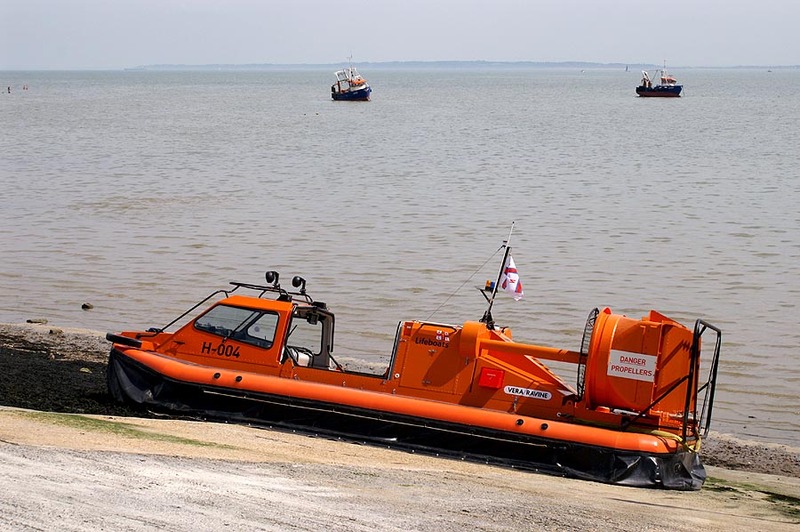 Southend Excursion Vessels shows the pleasure boats of Southend. 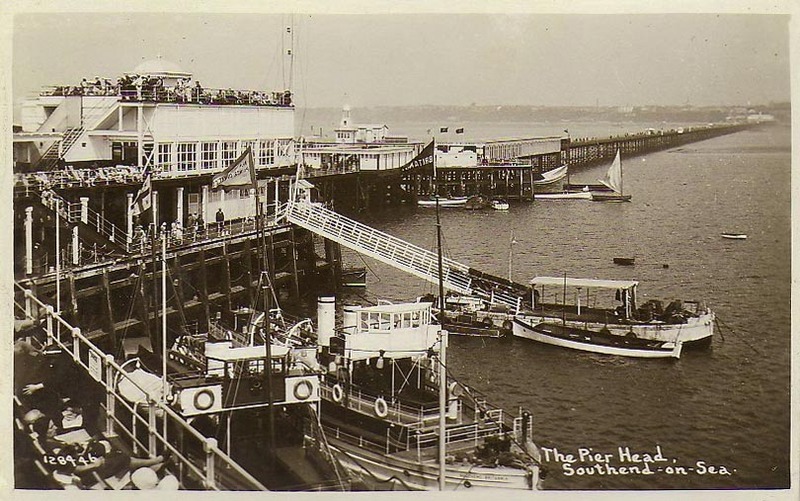 Southend Pier Postcards Postcard of Southend Pier. 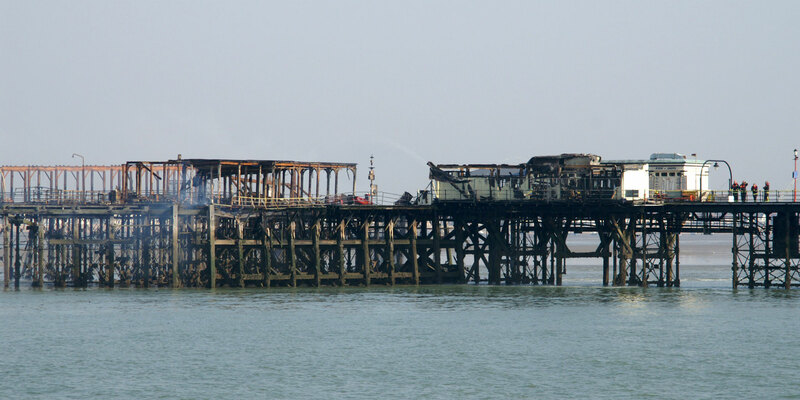 On the night of 9th/10th October, a fire started in the pub by the station on Southend Pier. The station, pub, and a cafe were destroyed, although the metal structure was not badly damaged. 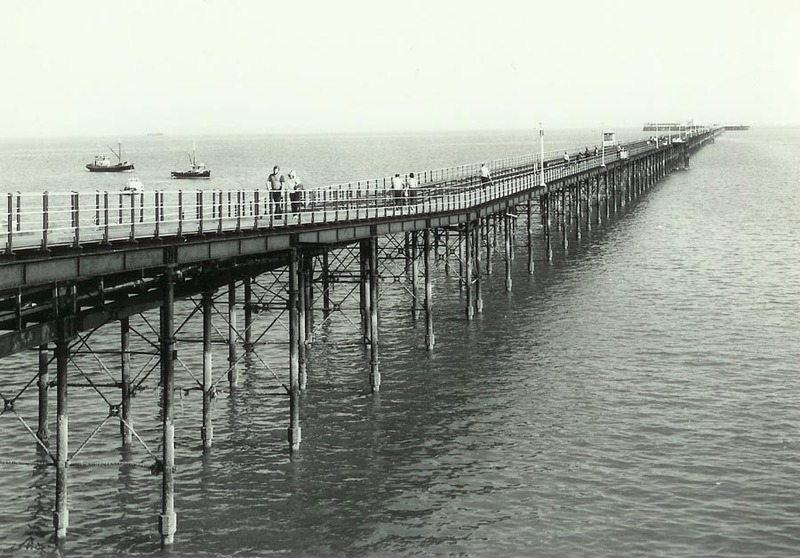 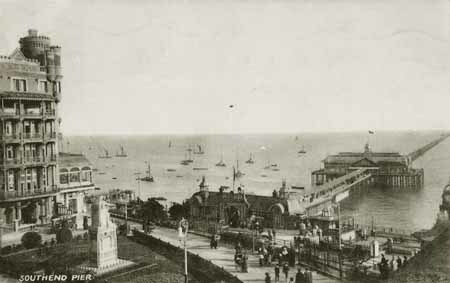 The fire was at the original end of the pier (it was lengthened some years after original construction). 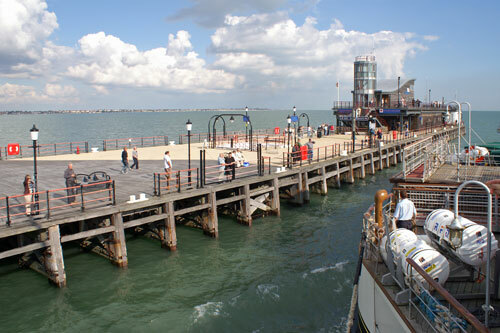 PS Waverley was due to call at the pier on 10th October on a cruise to Whitstable. She sailed as close as possible as the pier, which continued to smoke. The full length of the pier was not reopened until August 2006. 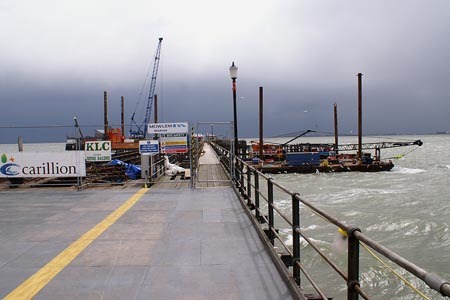 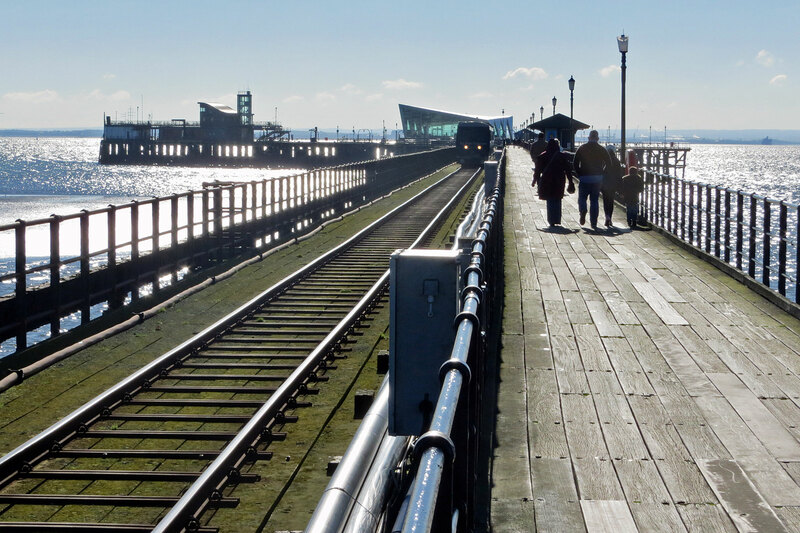 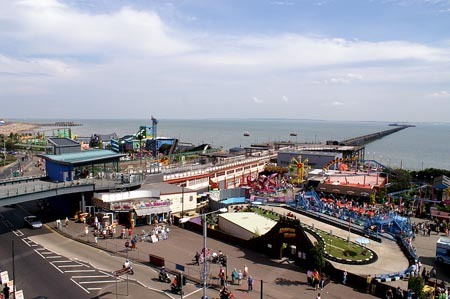 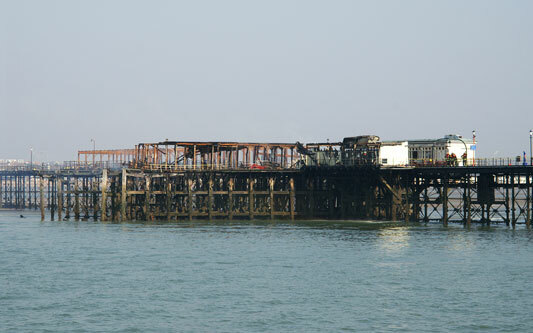 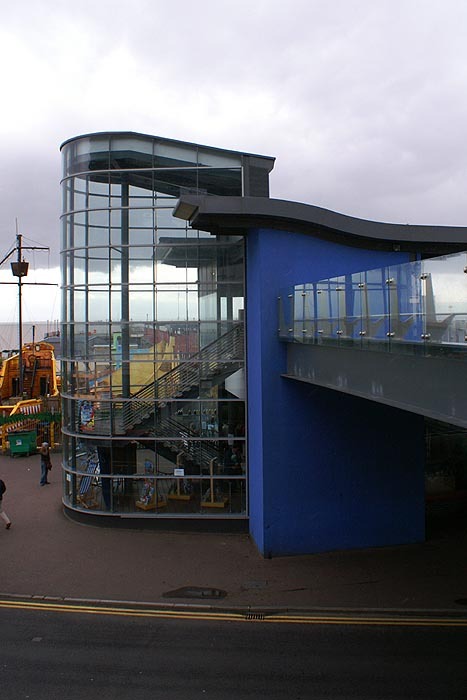 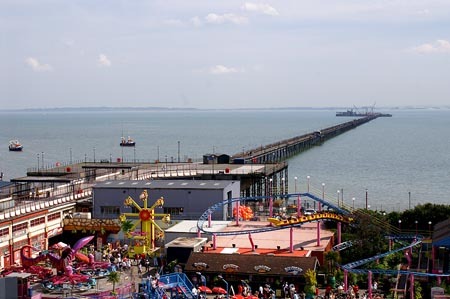 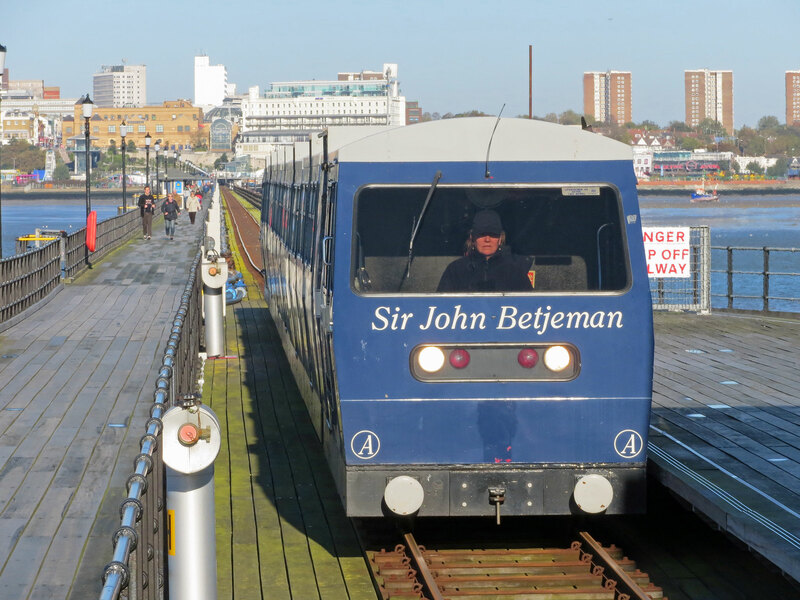 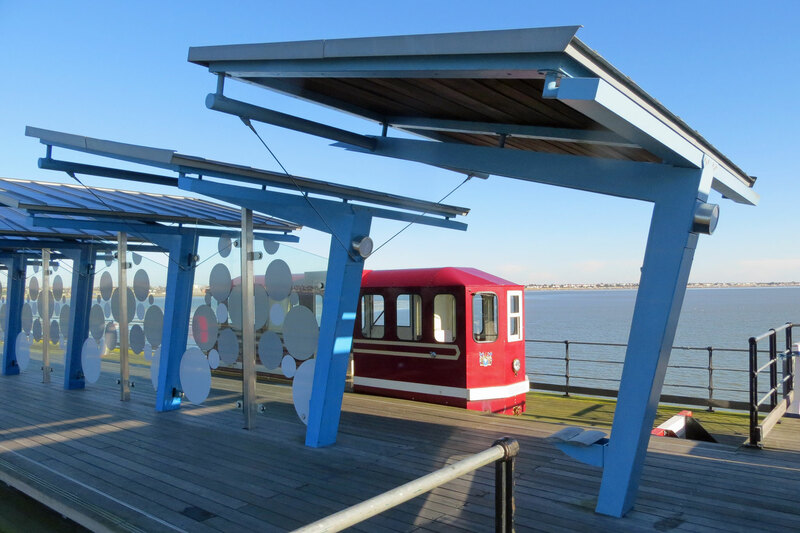 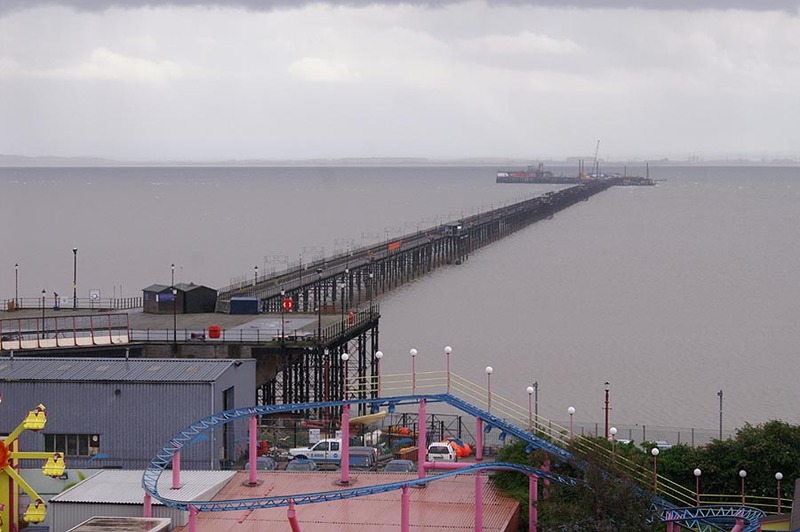 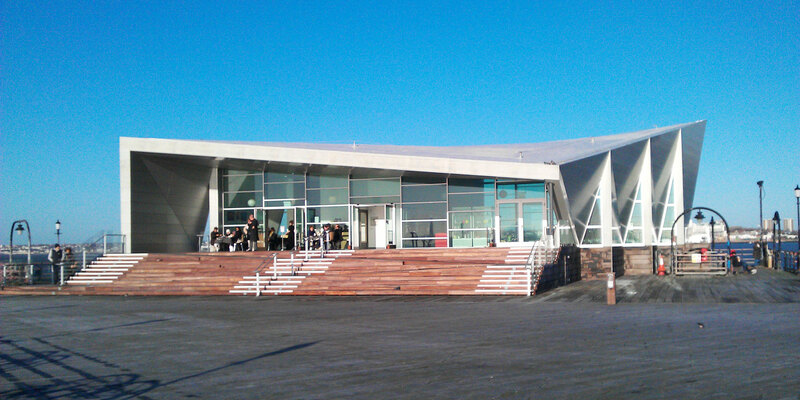 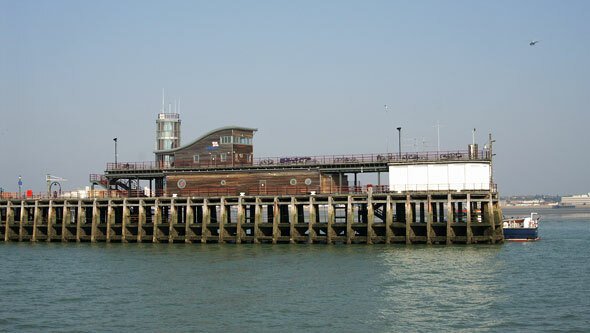 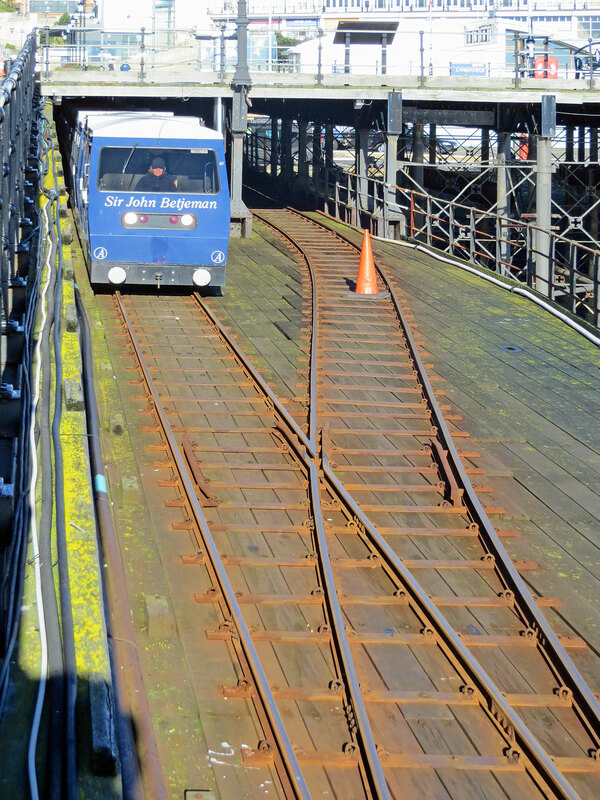 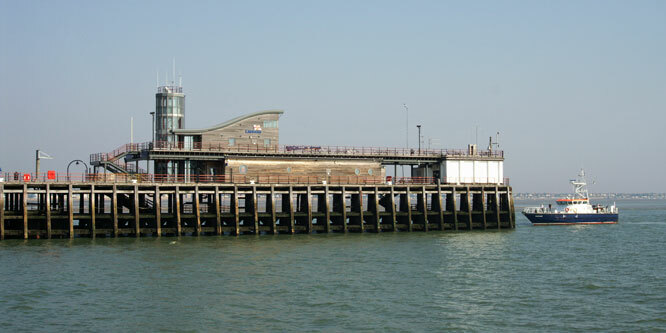 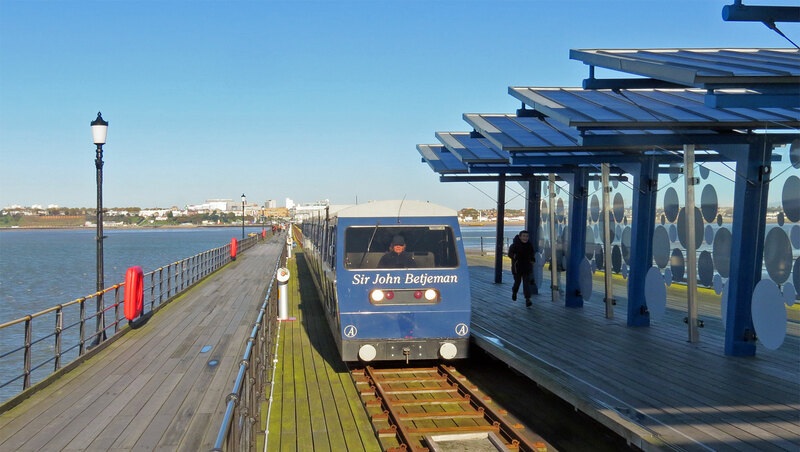 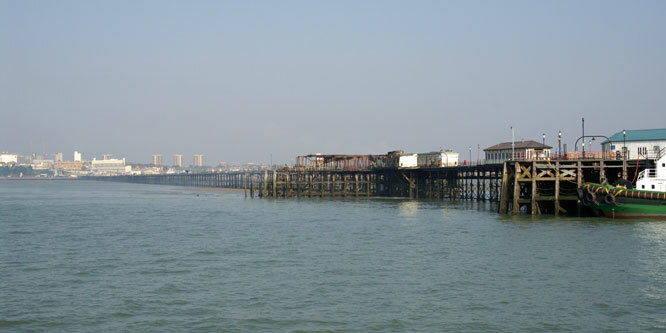 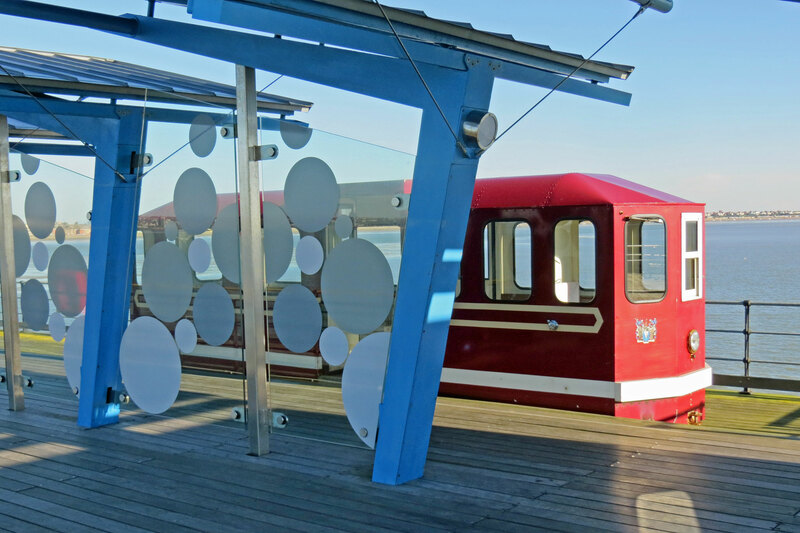 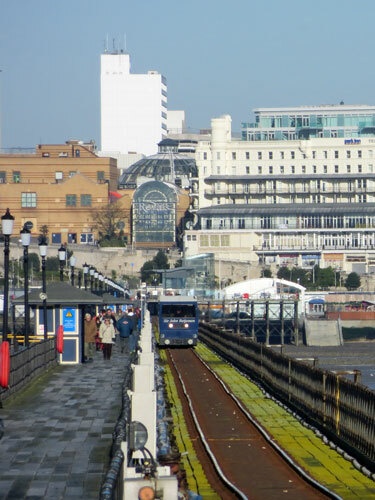 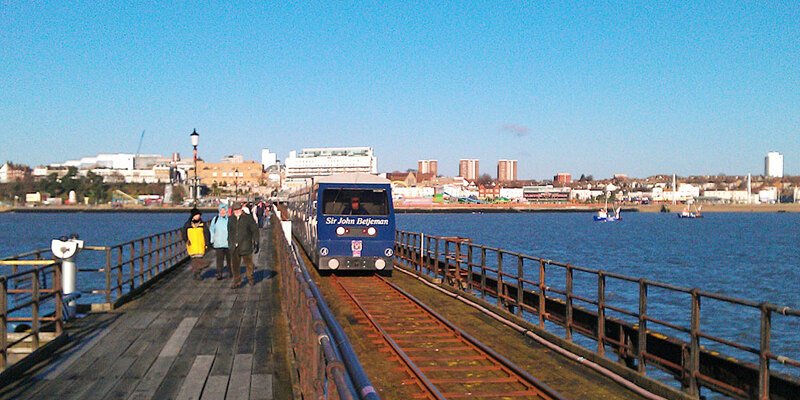 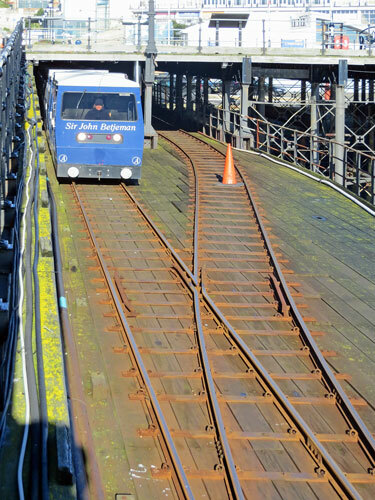 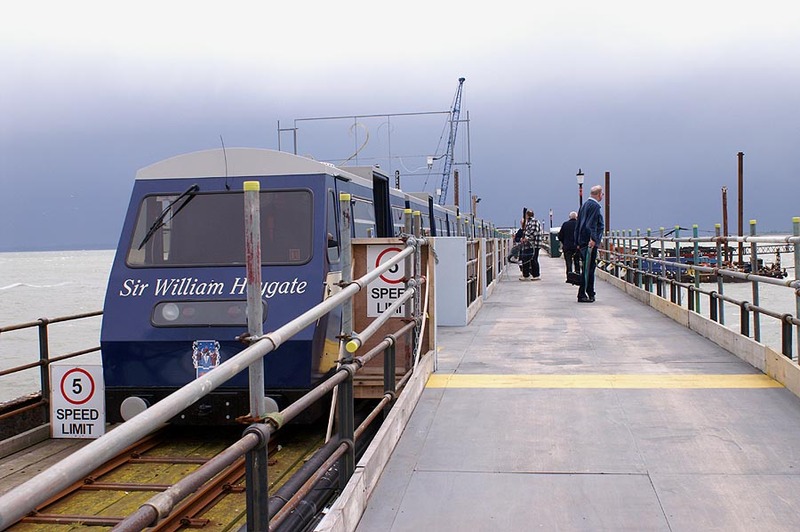 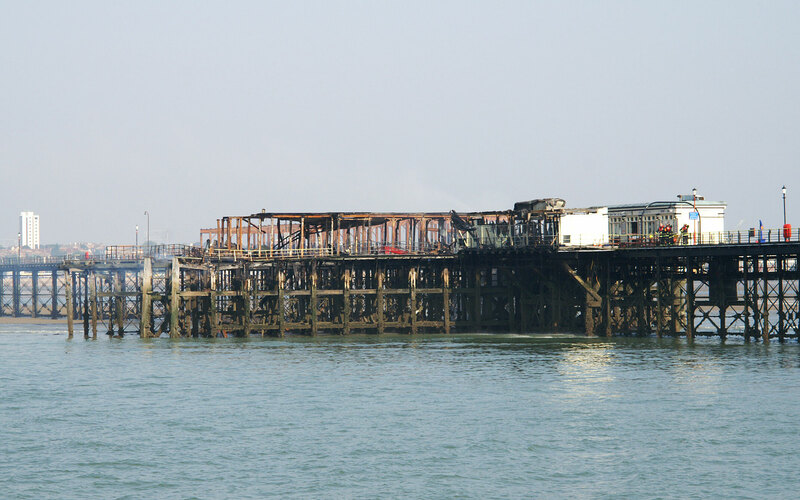 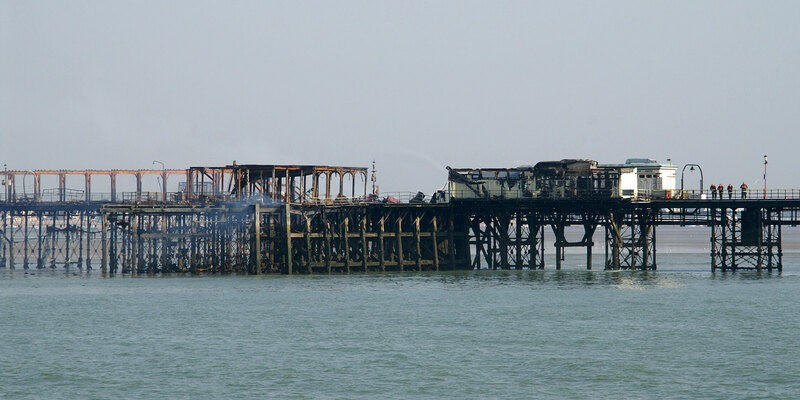 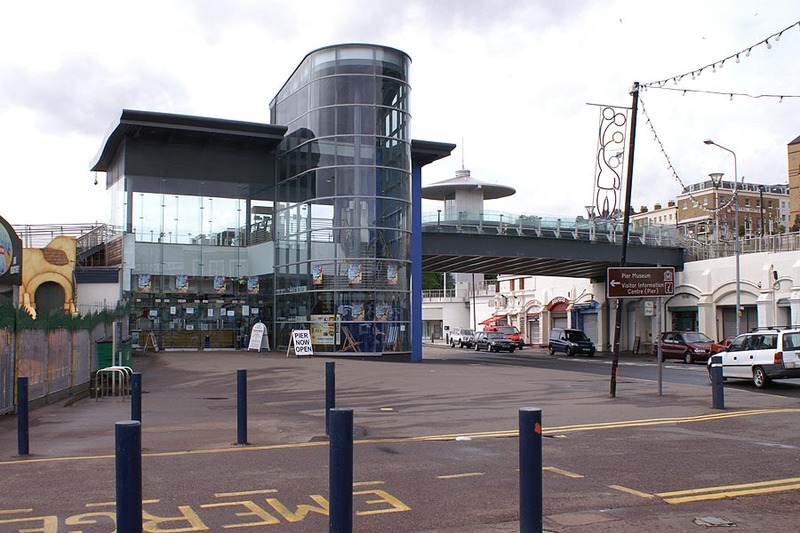 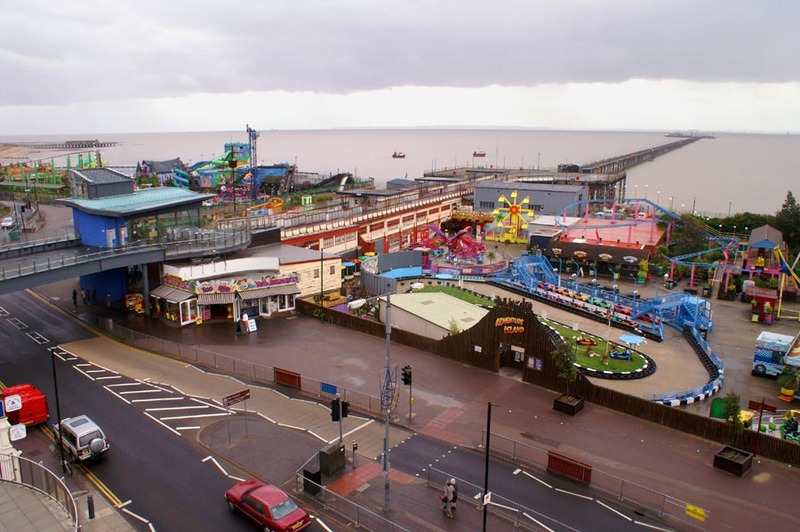 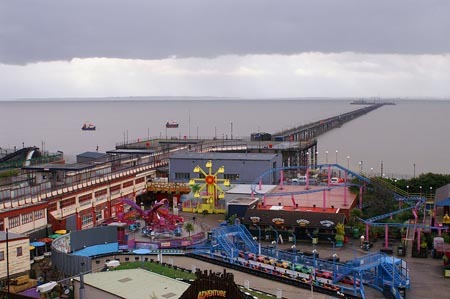 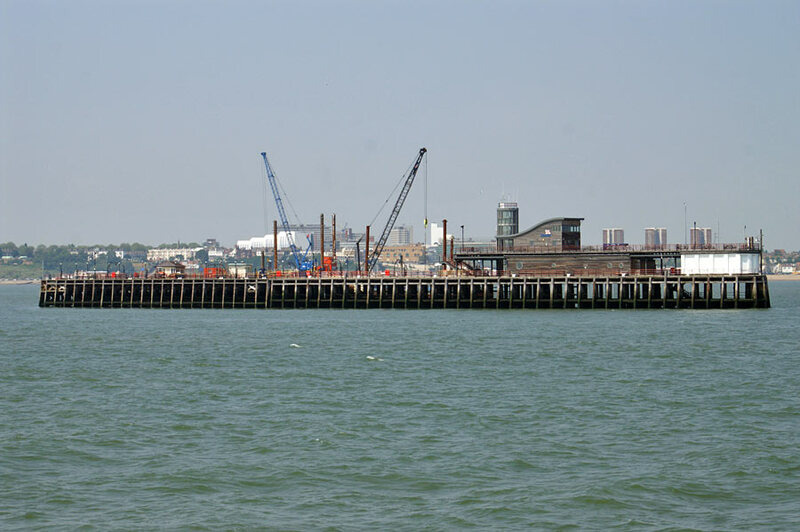 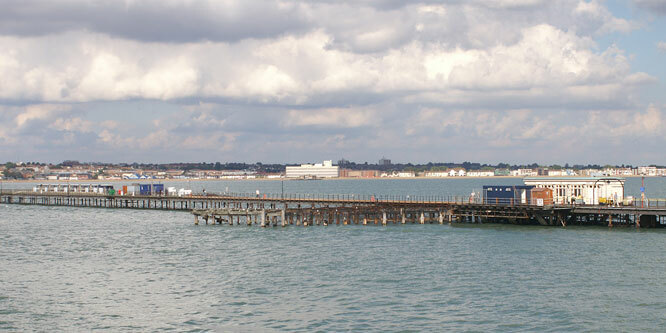 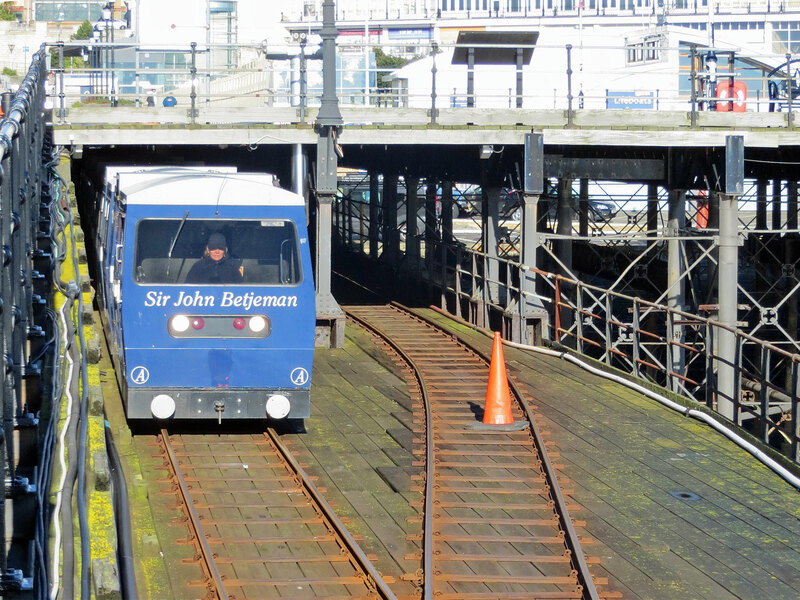 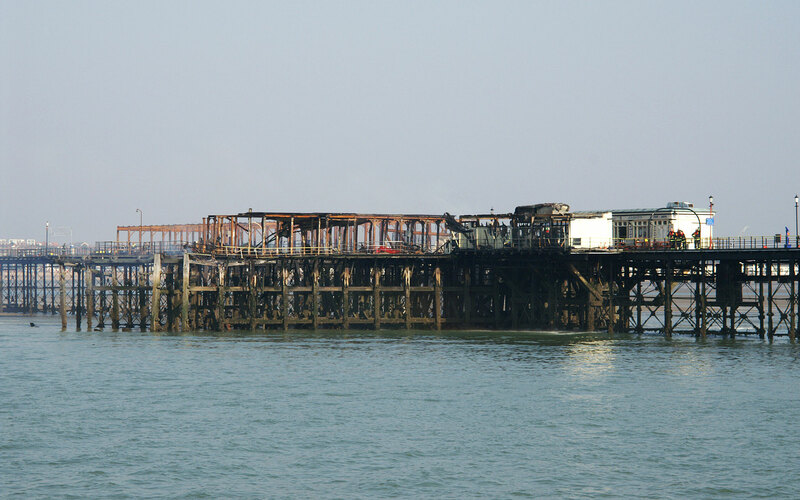 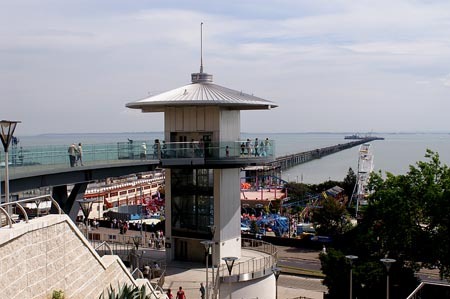 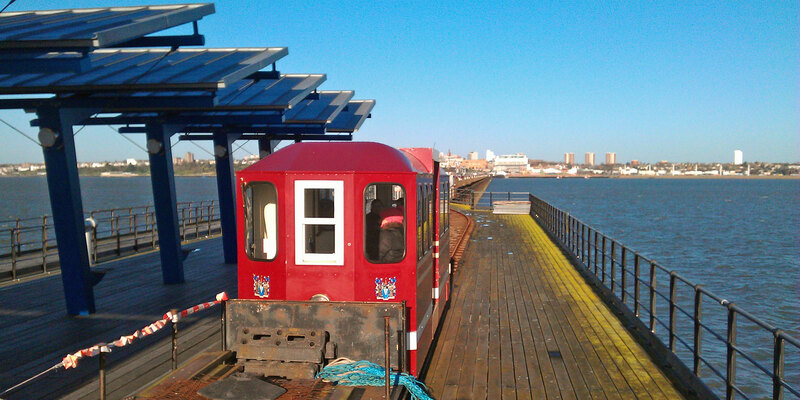 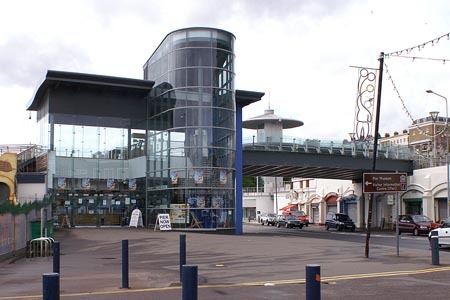 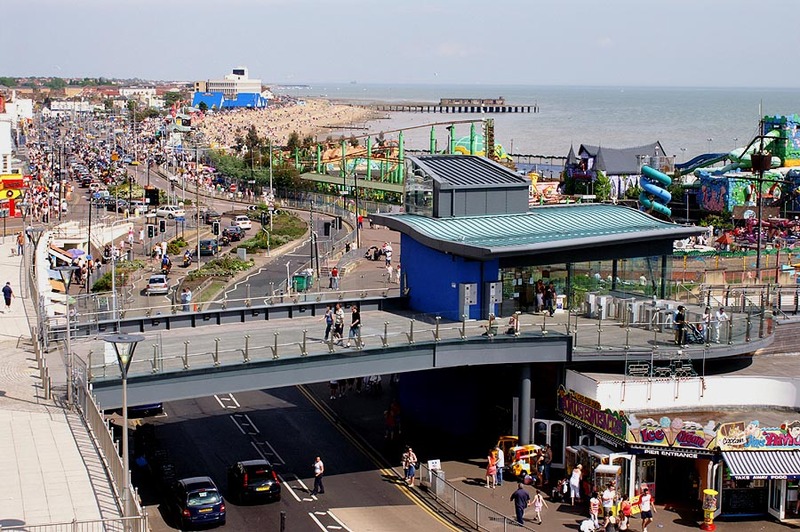 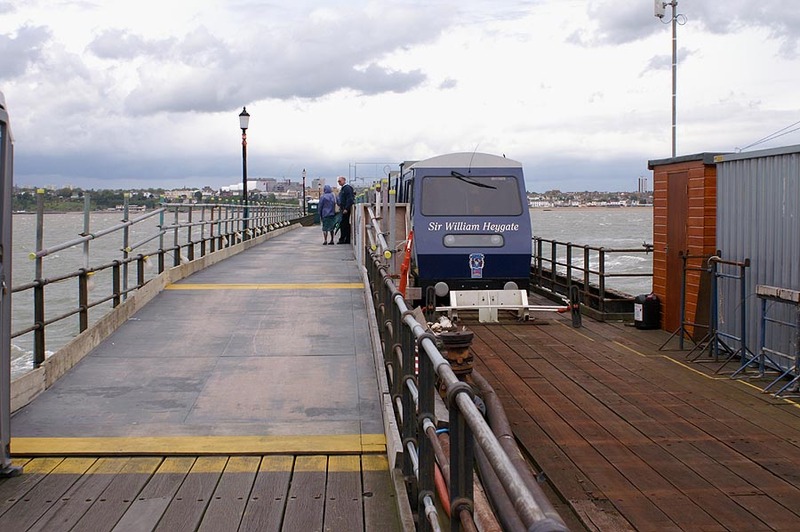 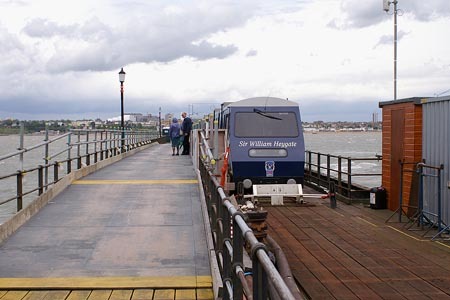 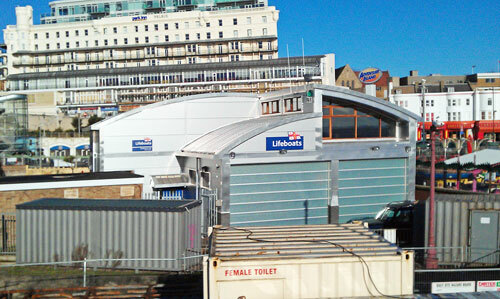 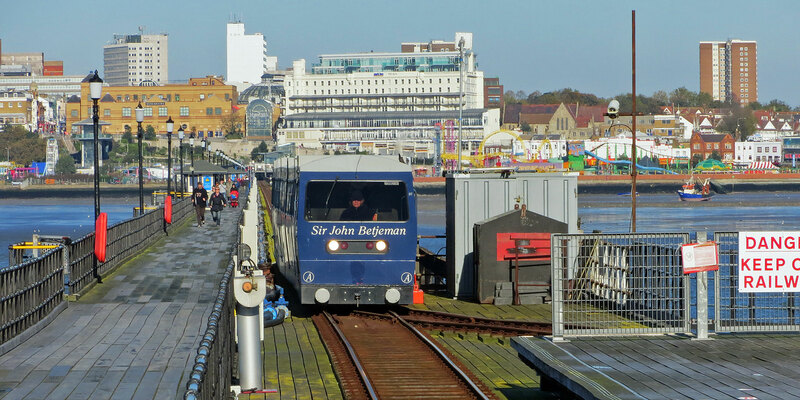 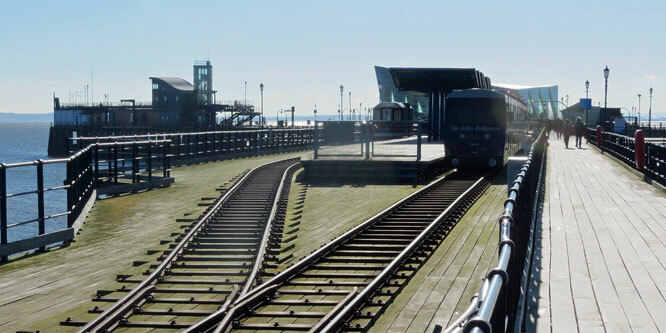 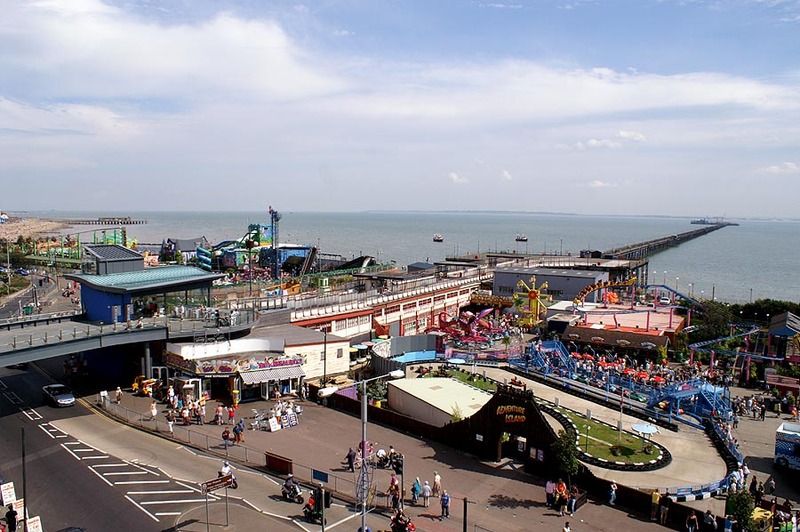 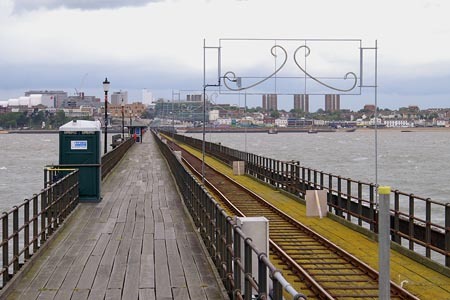 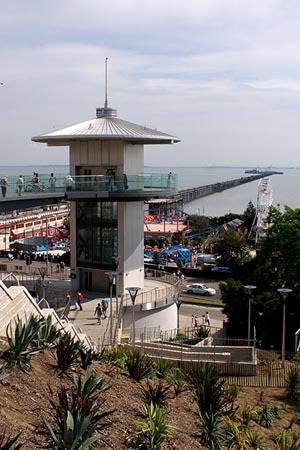 The 2005 fire on Southend pier prevented access beyond the site of the old station. 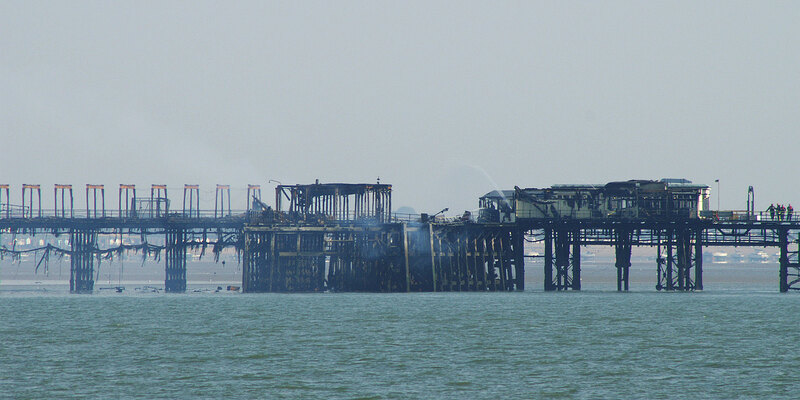 A temporary station was built whilst the burnt section was rebuilt. The full length of the pier was not reopened until August 2006. 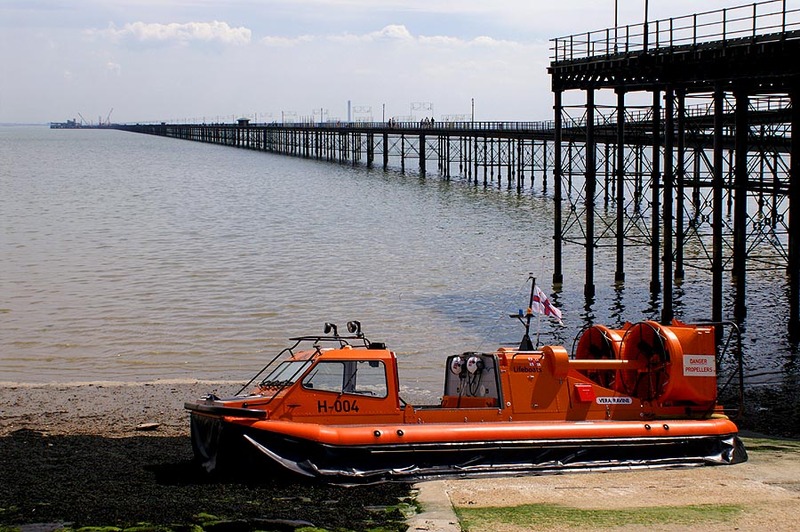 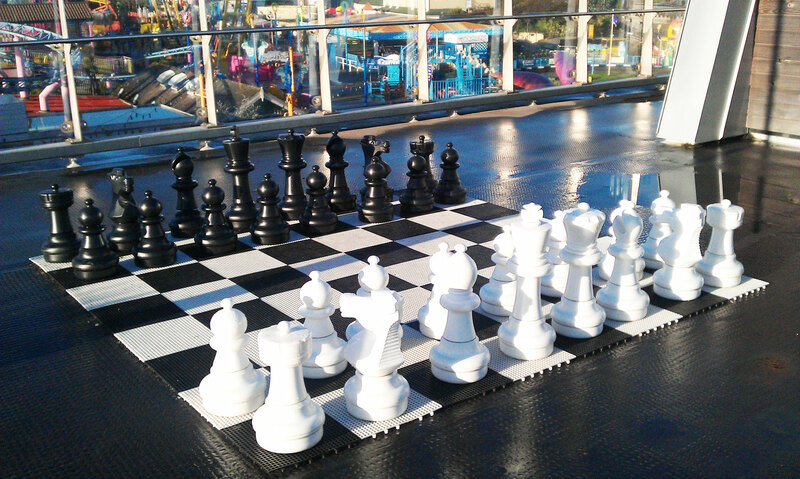 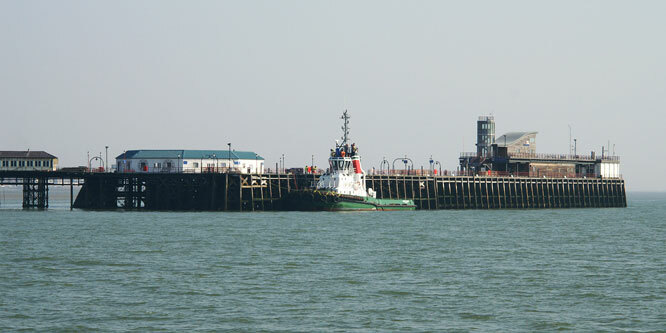 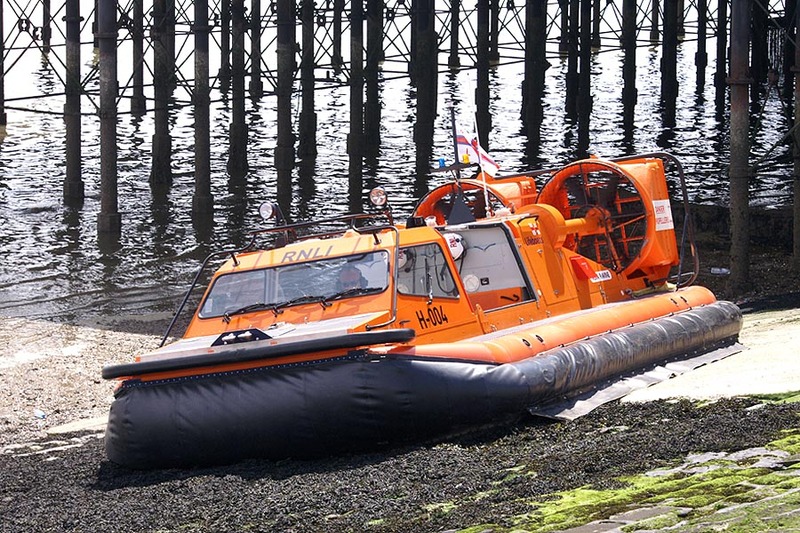 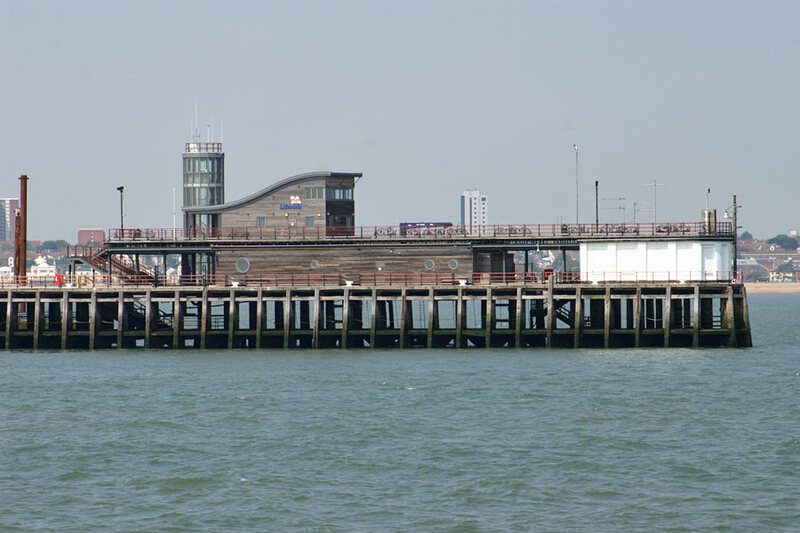 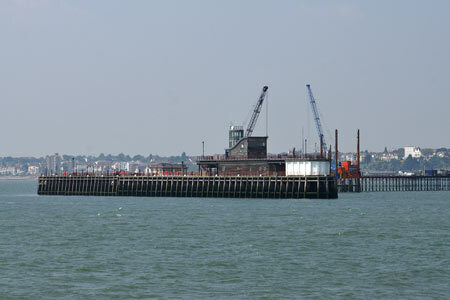 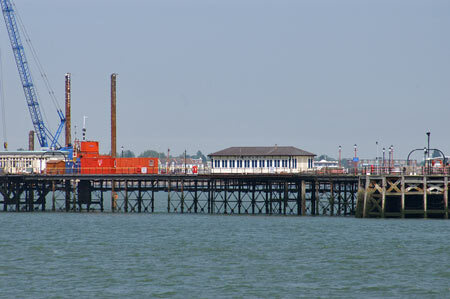 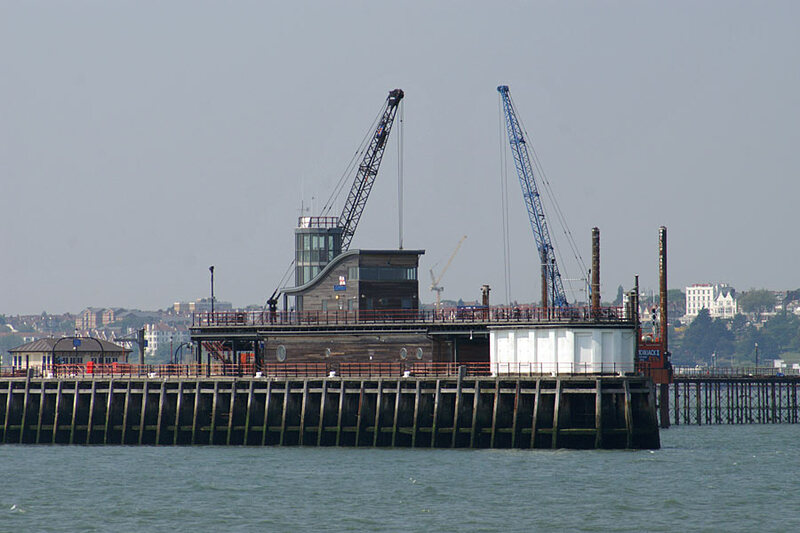 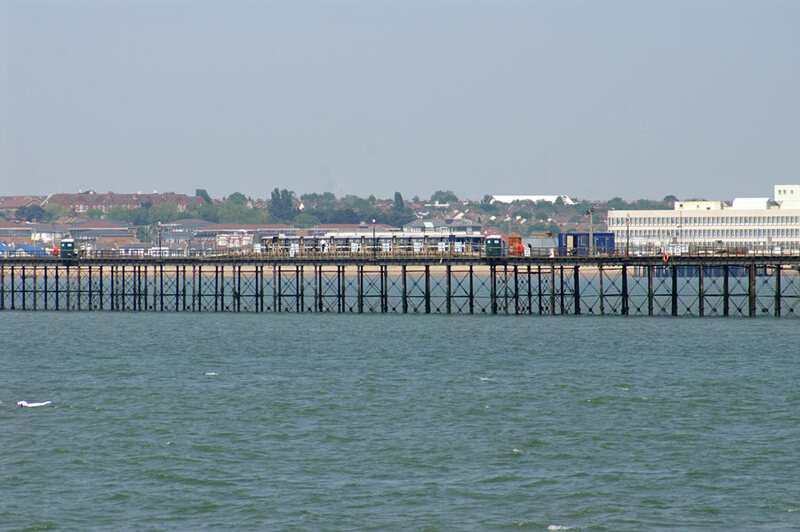 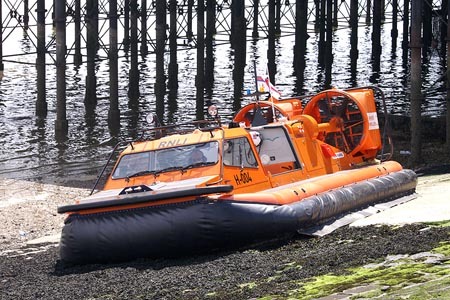 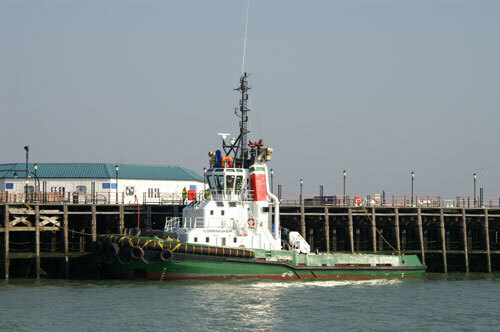 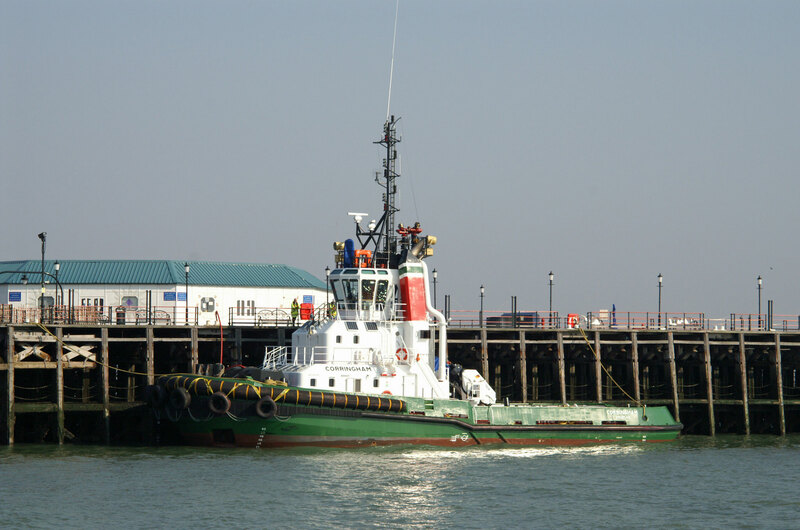 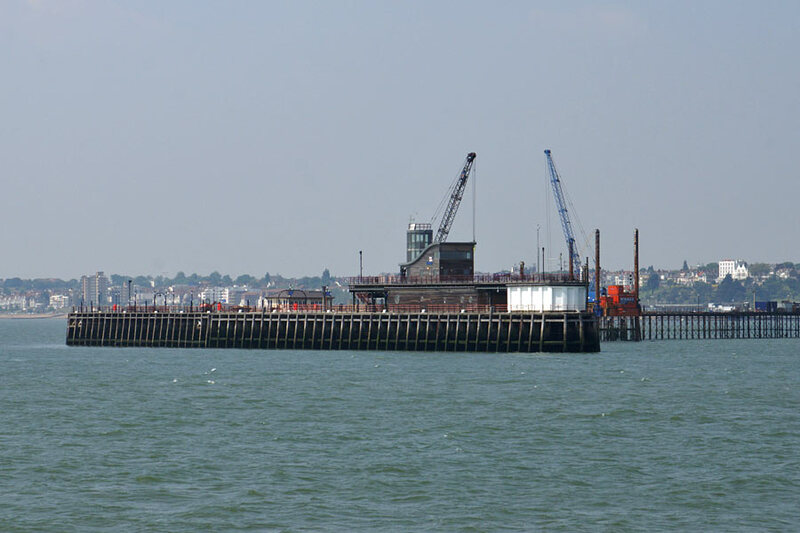 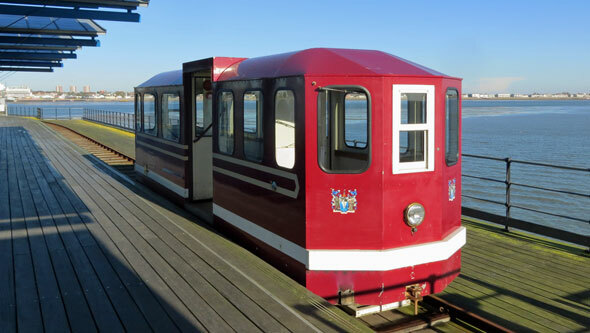 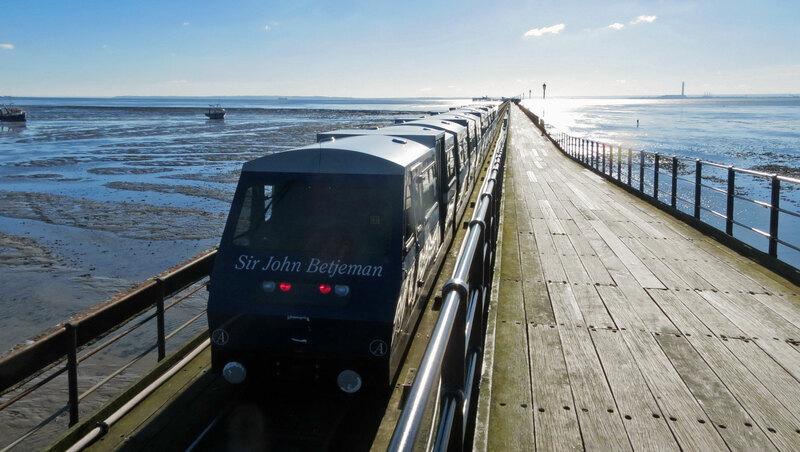 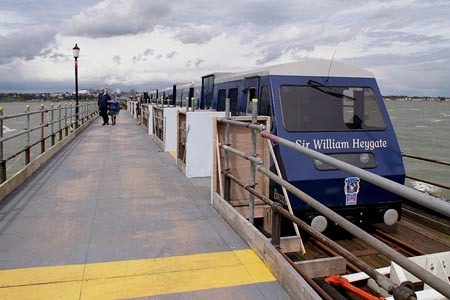 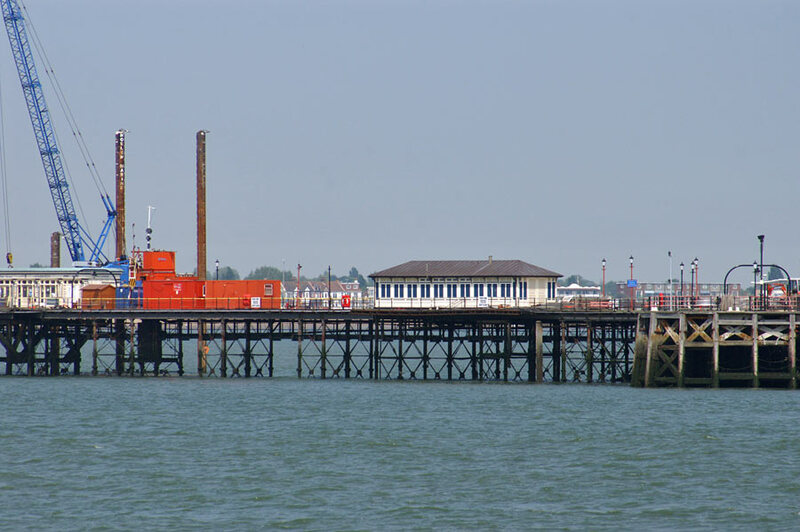 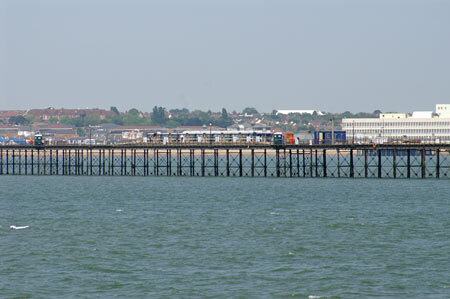 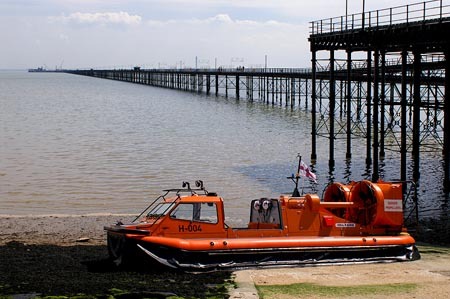 Southend pier was not reopened fully until August 2006 after the 2005 fire, in time for PS Waverley's September/October visits. 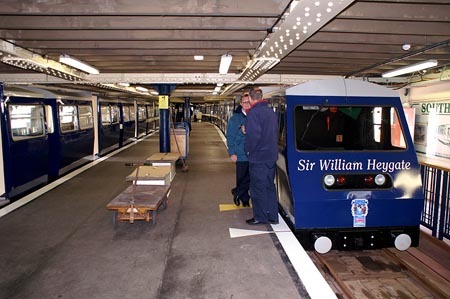 The railway was reopened by Princess Anne on 2 May 1986 after rebuilding to 3 ft (914 mm) gauge. 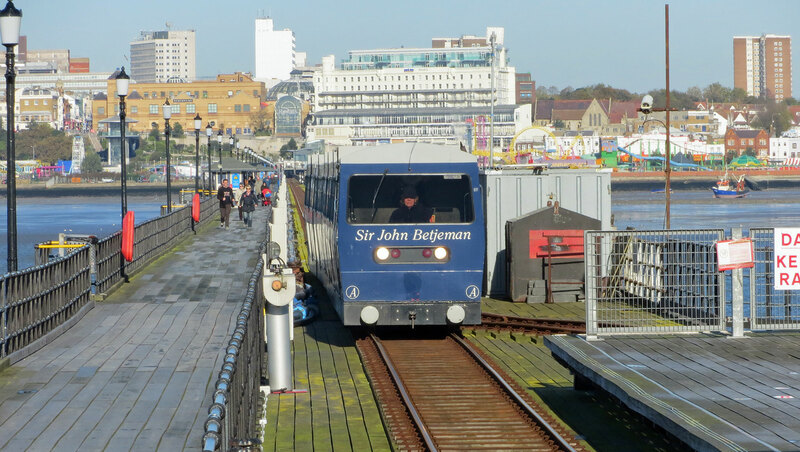 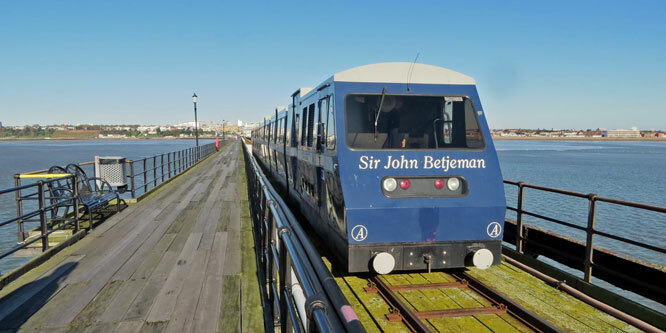 Two new diesel trains were built by Severn-Lamb and introduced on a simplified line comprising a single track with a passing loop and twin track terminal stations. 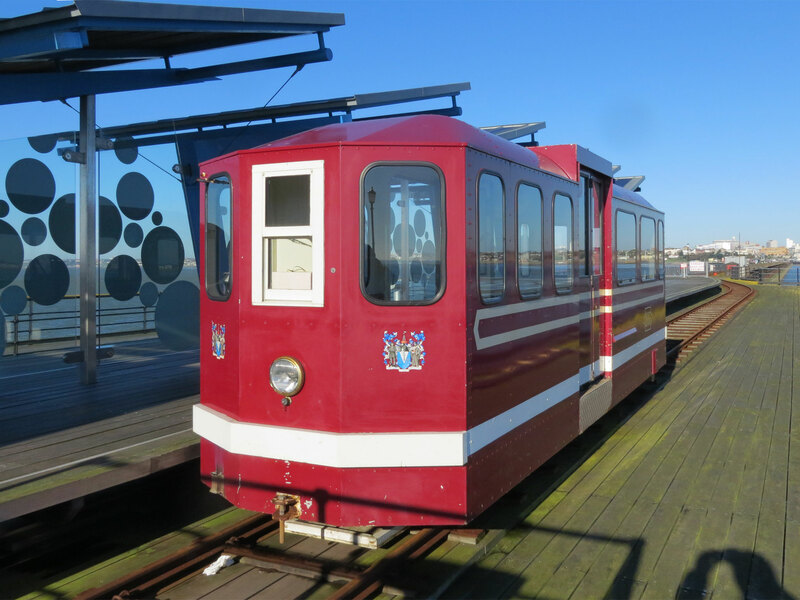 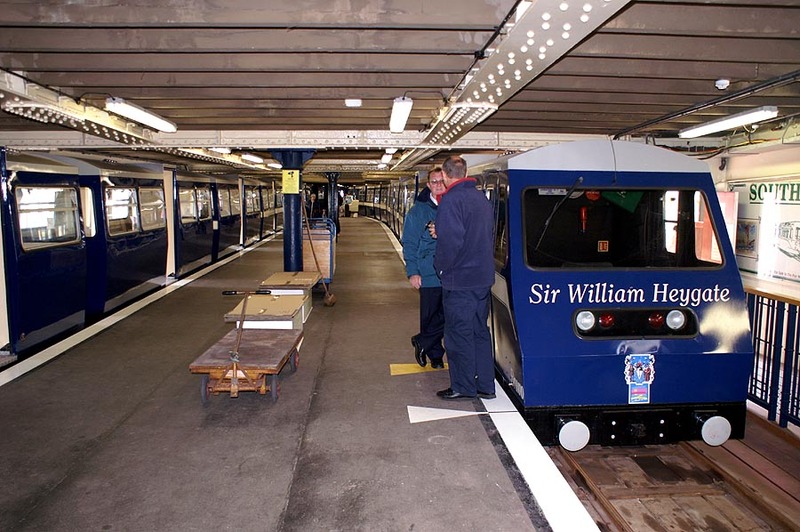 As originally delivered, the trains were liveried in all-over burgundy with a white waist-band, but were repainted to a two-tone blue in 2006, retaining the white waist band. 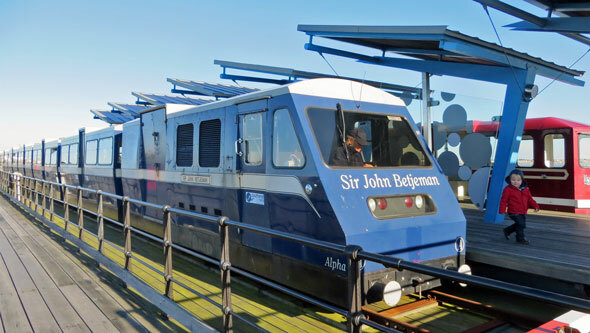 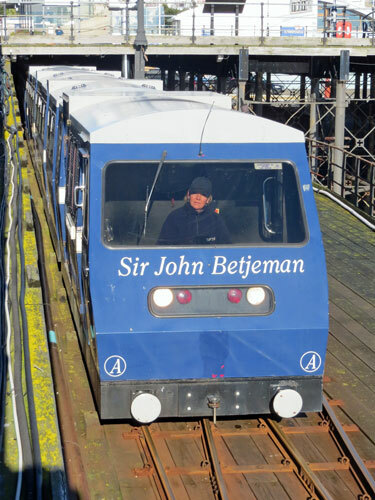 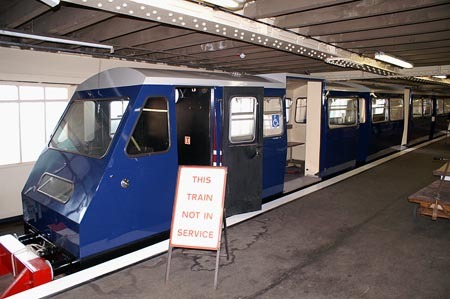 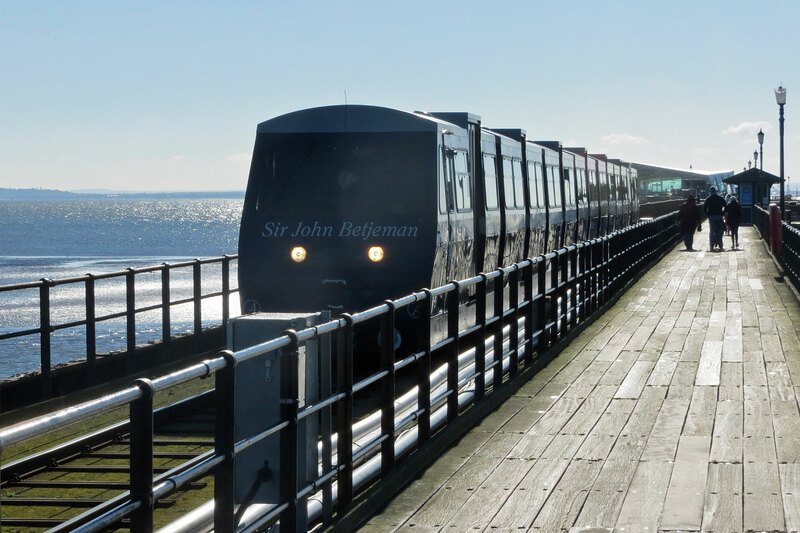 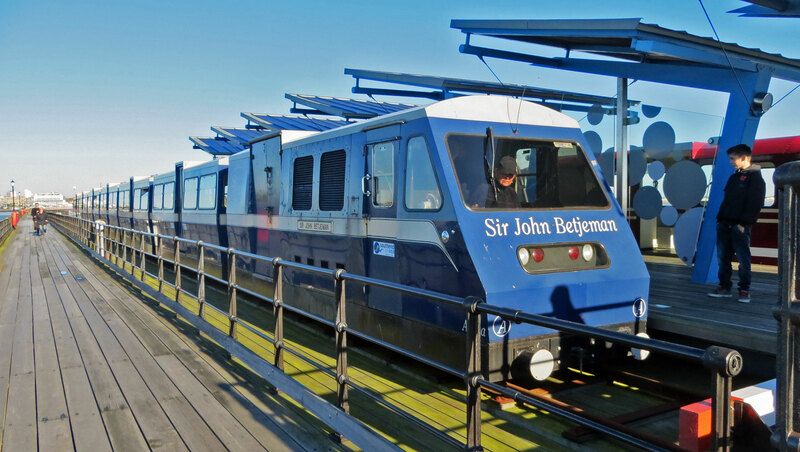 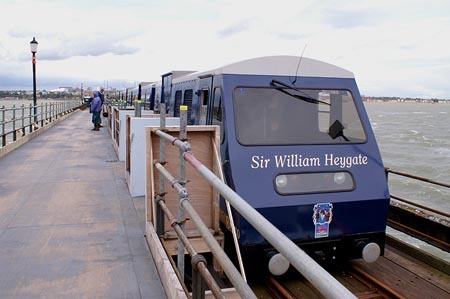 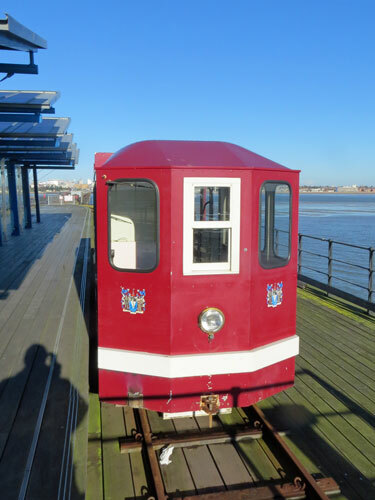 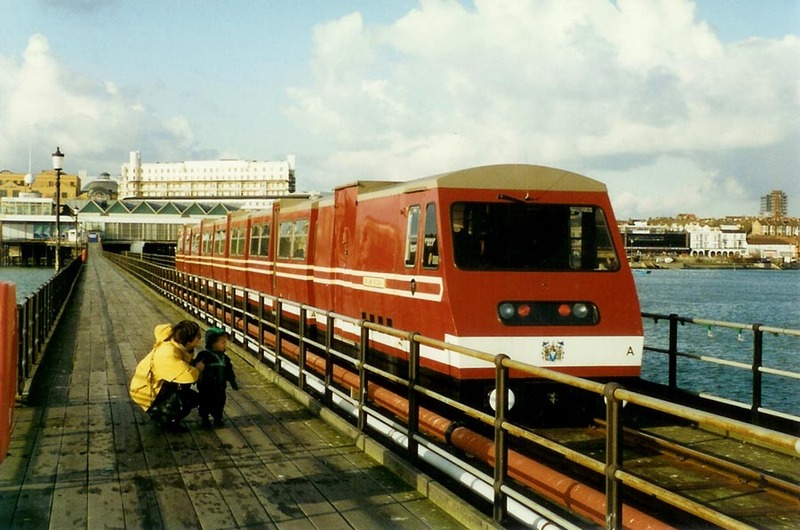 A battery powered single passenger car, built by Castleline of Nottingham, entered service in November 1995 for service in winter. This car is numbered 1835, the year that Southend Pier first appeared on Admiralty charts. 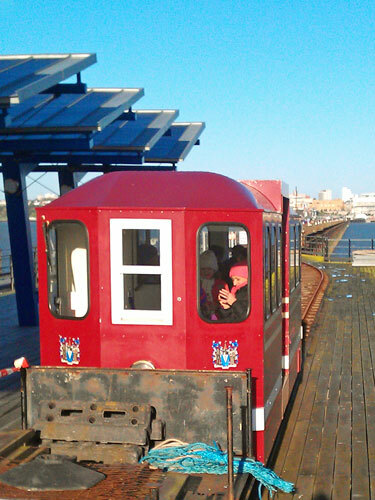 I had never seen this vehicle outside of the gloomy station before. 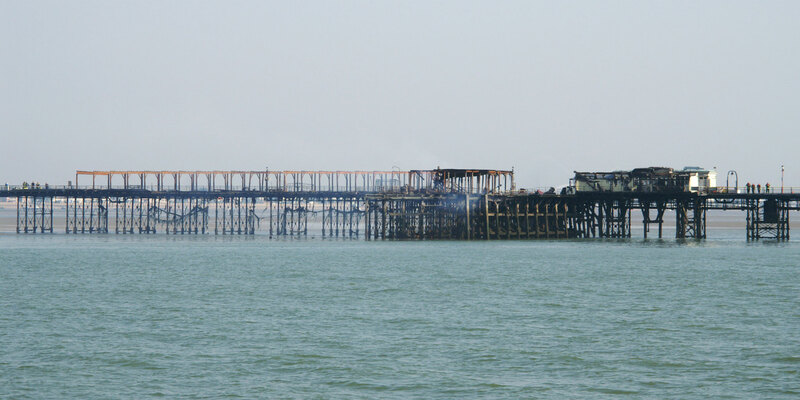 A major fault of the current station at the end of the pier, built after the latest fire, is its lack of any protection from wind and rain. On 1st January 2013 1835 it was being used as a mobile waiting room. Glass screens have finally been installed to afford some protection against the wind on the platform. 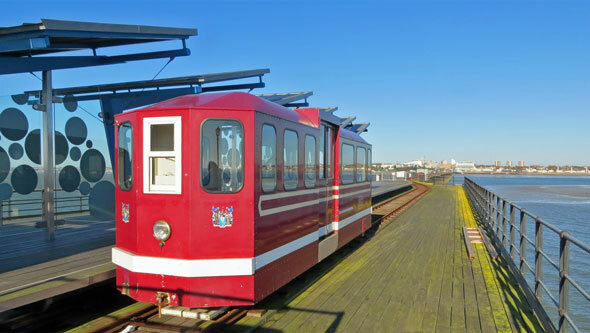 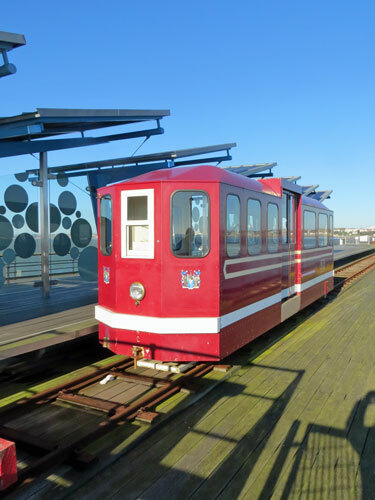 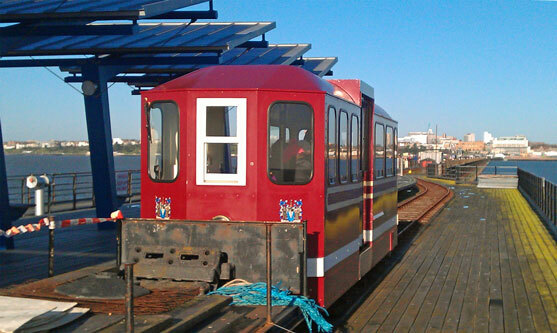 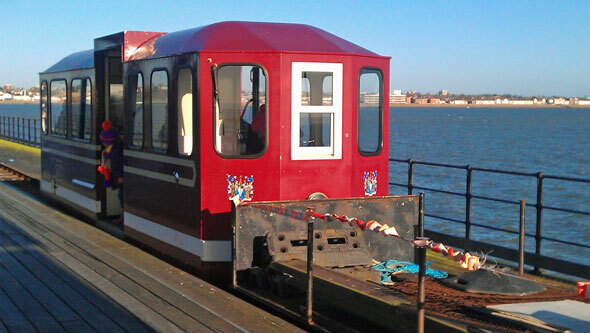 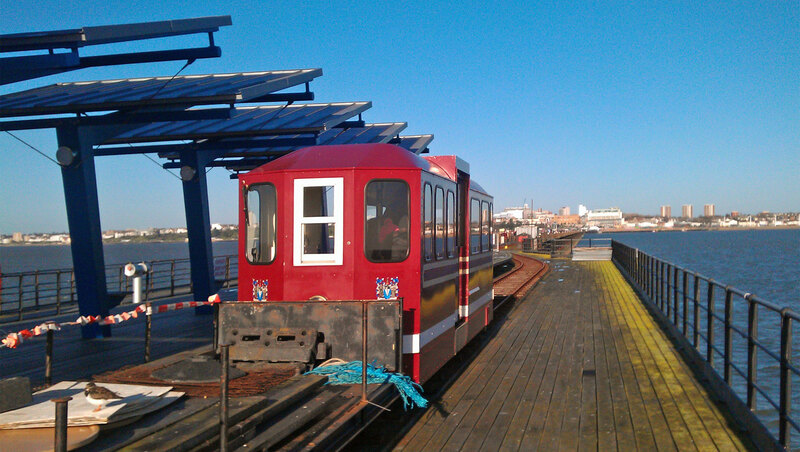 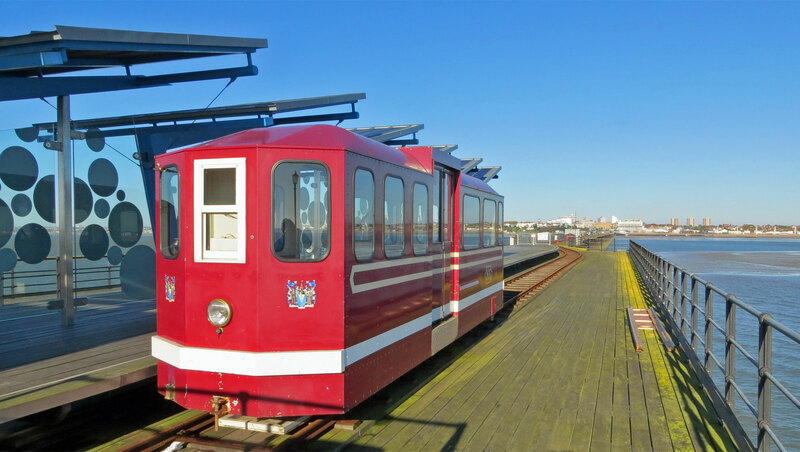 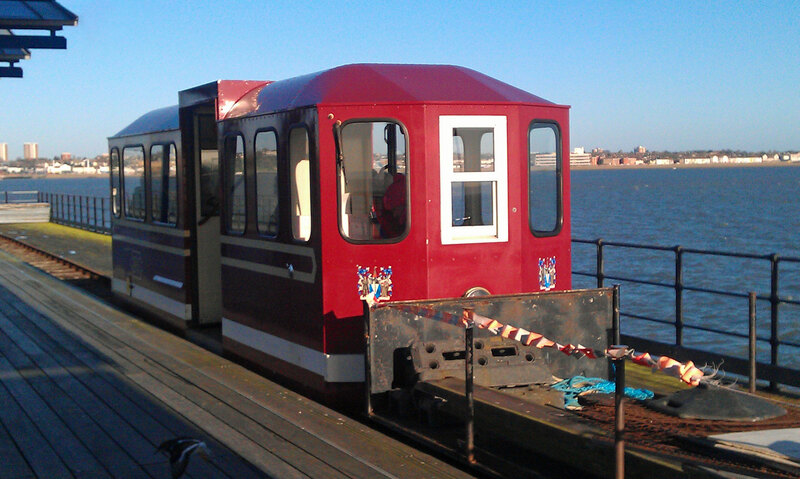 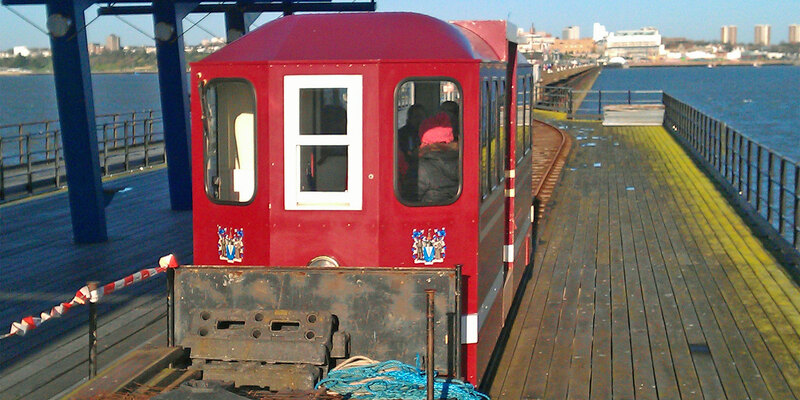 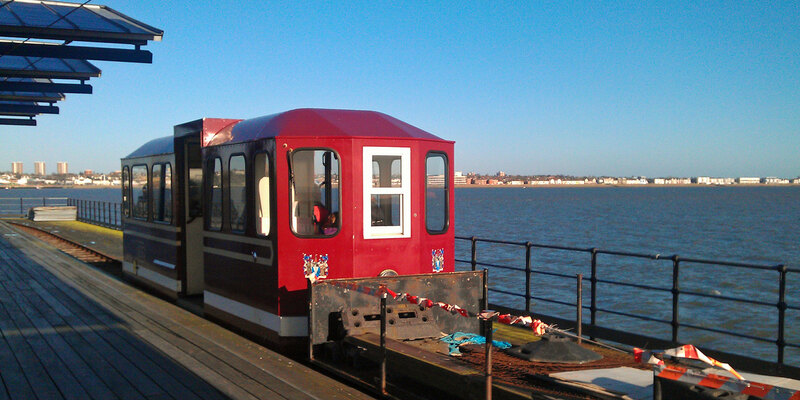 However, the battery railcar 1825 is still being used as a mobile waiting room.